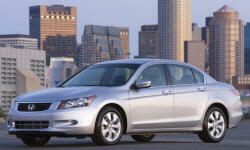 Honda Accord Fuel Economy Pros and Cons | Page 1 of 4 | Why Not This Car? Max I get is 30 average on the highway. With lots of short trips I get a blended MPG of 20. Excellent fuel economy. I still get more than 27mpg in the city with the airconditioning on. Highway driving gets me 37+ with the airconditioning on. Great fuel economy. I have the V6 and I usually average between 28 and 29 mpg overall. I do mostly highway driving and some suburban roads. And I'm usually doing about 70-80 mph on the highway, so you can do even better if you were to be driving 55-60 mph. During mostly Interstate driving, I achieve 32-34 MPG (calculated manually). The fuel economy was very good considering the stop &amp; go traffic of Phoenix as well as using the A/C extensively in the summer. Outstanding fuel economy. Regularly exceeds EPA estimates. Recent 100 mile highway trip with no AC produced 37.2 mpg. Unbelievable for V6. Pretty good over all, I've gotten as much as 35-36 MGP on a long highway trip, 29 - 31 around outer suburbia where I commute. Along with providing excellent performance for a non-turbocharged four-cylinder in a midsize sedan, the new powertrain also achieves excellent fuel economy, 27 mpg city and 36 highway in the EPA's testing. The Nissan Altima does a little better (27/38), but everyone else lags. Excellent fuel economy, 24 around town and up to 36 on the interstate and as high as 38 on two lane roads. I have gotten over 700 miles to a tank on long trips. Power with the ability to obtain high fuel mileage is a nice combination. Due to the terrible 4spd auto, which (at 244k miles) is original, mileage is decreasing as the planetary gears get fouled with clutch deterioration. Average 18-20 mpg for mix city and highway (50/50) driving. I was expecting more of 24-26 but it seems Honda increase size gave more comfort at expense of bad fuel. Too soon to tell, but past experience has shown strong mpg even with a 6cyl - definitely above 20 with a lot of town/city driving.